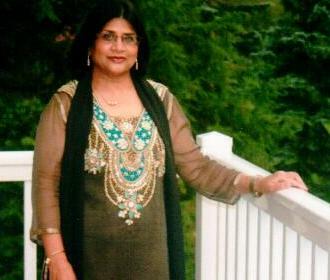 Mrs. Sandhya Patel, age 60, of Allegany, New York died Saturday, June 21, 2014 at home following a long illness. Born on November 2, 1953 in Prantij, India, she was the daughter of Suryakala Desai Shah and the late Popatlal Shah. She was married in August 1978 in Elkton, Maryland to Dr. Arun Patel, who survives. She earned her pharmacy degree at the University of Bradford in England and from SUNY Buffalo. She received her MBA from St. Bonaventure University. Mrs. Patel had been employed as Pharmacist for the Seneca Nation of Indians. She also worked for Cuba Memorial Hospital and Olean General Hospital. She was a member of the Hindu Society of Olean, New York. She enjoyed cooking, gardening, travelling, and entertaining friends. Surviving besides her husband are: 2 sons, Rajan Patel, DPM, San Francisco, CA and Amit Patel, MD, Jersey City, NJ; 2 sisters, Latika (Susanata) Ghosh, Claremont, CA, Smita (Rajesh) Shah, London, England; 2 brothers, Mukesh (Meeta) Shah, Whittier, CA, Ajit (Neelam) Shah, London, England; several nieces and nephews. Friends may call at the Casey, Hartwig & Hartle Funeral Home, 3128 Route 417, Olean, New York on Sunday from 4 – 7 pm. In lieu of flowers, the family suggests memorials to Home Care & Hospice, 1225 West State Street, Olean, New York, Roswell Park Cancer Center, Olean General Hospital, or the donor’s choice.